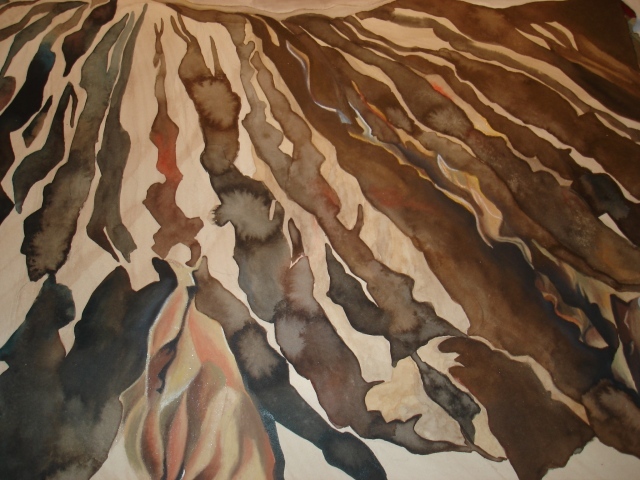 Combining imagery of cave systems with the lining of the intestinal tract, my paintings aim to explore the relationships that exist between these two interior spaces. Both landscapes of unseen places, they are unique expanses which are all entrance and interior. Floating on the paper, the landscapes blur the line between body and nature. The abstract yet contained journey into the unknown is realized visually on the surface of each image, allowing mystery to remain just around the next bend. The images are transformed from endoscopic pictures to fantasy worlds of holes and caves. The paintings and drawings serve as an entry portal into an unimaginable universe of twists and turns.